A lack of enforcement or inspections and legal loopholes are leaving migrant workers in Iowa vulnerable, cheated of wages and living in substandard housing, an IowaWatch investigation revealed. Over the course of three years, one Iowa lawyer dealt with 39 migrant worker cases of wage theft, broken contracts, substandard housing, working arrangement violations and Agricultural Workers Protection Act violations. Attorneys who spoke with IowaWatch said many cases likely go unreported because workers are afraid of losing their jobs or because workers are undocumented and fear deportation. Federal and state laws exist to protect these workers, but the workers often are at the mercy of farm labor contractors who receive little oversight from the large agricultural companies that hire them. Housing for migrant workers in Iowa must receive a permit, but evaluation of the housing is self-administered and inspections are made only following complaints. Some contractors fail to provide workers with pay stubs that include hours worked, which makes it difficult for workers to prove wage theft if they bring a complaint to trial. 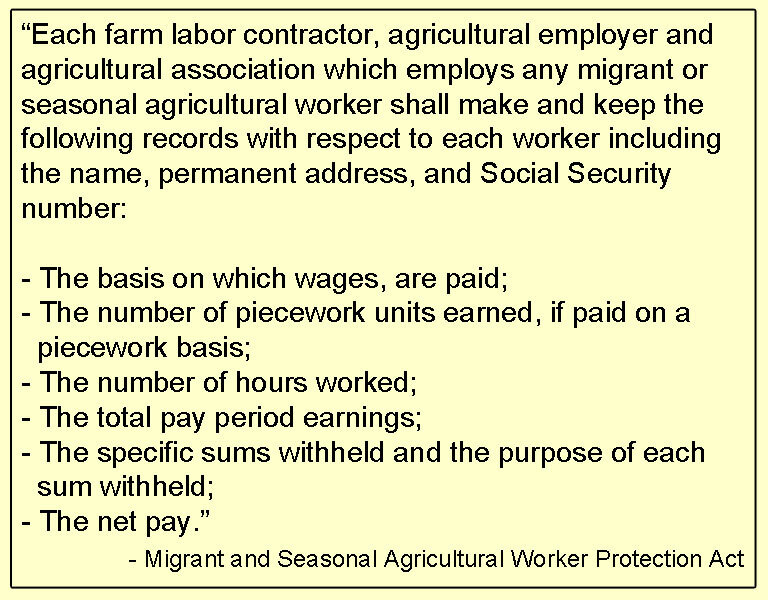 Farm labor contractors are hired by larger agricultural businesses to recruit, house, and supervise migrant workers. The companies are supposed to “take reasonable steps” to ensure contractors are registered under a federal license, but often are not held liable for a contractor’s actions. Noé Alegria, who has been a migrant worker since 2010, said he has had bad experiences with contractors in Iowa and Nebraska. “I wish the contractors would be more humane, that they wouldn’t abuse their power. Instead of cheating us, that they’d pay us what we’ve earned. Because if it weren’t for us, the workers, the job wouldn’t get done,” Alegria said. 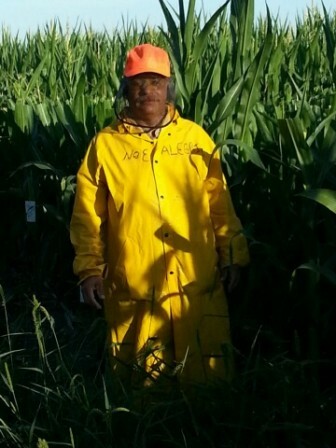 Migrant worker Noé Alegria, in a Nebraska farm field in summer 2013. Alegria is one of 13 migrant workers who sued Monsanto in U.S. District Court in Texas for failing to pay wages due while working in Iowa. Monsanto settled the case. Alegria, 51, of San Juan, Texas, was one of 13 workers who filed a lawsuit this year against Monsanto and three individuals who recruited and housed the workers. His son, Noé Alegria Jr., 18, worked with him, and is listed as a minor in the case. Noé Jr. was 16 years old at the time. Migrant workers, or agricultural workers who can’t travel to their permanent residence at night due to distance, often are involved in roguing and detasseling Iowa’s soy and cornfields. Roguing, or “walking the beans,” involves going through the rows of soybean plants to remove large weeds. Detasseling involves removing the tassel, the top part of the corn plant, in some rows in order to promote cross-pollination in the production of hybrid corn. Alegria moved to the United States in 1981 and worked in construction, pouring cement foundations and doing carpentry work. He started working as a migrant in order to support his kids’ education. He has nine children and is helping five through school. He said it has been difficult to find work in the southern part of Texas where he lives. “You don’t become rich working as a migrant. I’m doing this to help my children. It’s a sacrifice,” he said. The summer of 2011 was the first time Alegria had worked in Iowa. Alegria and the 12 other workers in the lawsuit were involved in detasseling and sorting corn near Boone, Iowa, in a field owned by Monsanto. The group filed a civil action suit in February in United States District Court for the Southern District of Texas. Texas RioGrande Legal Aid represented the workers. RioGrande Legal Aid is a non-profit legal service in southern Texas near the Mexico border that frequently handles migrant worker cases. Although the organization is located 1,000 miles south of Iowa’s border, it often handles the cases of migrants who worked in Iowa. The complaint claimed Monsanto and the contractor, Alejandro Moreno, of McAllen, Texas, failed to pay wages when due. It said workers weren’t paid fully and deductions were taken from some workers’ pay for housing and repayment of advances. The deductions didn’t appear on pay stubs. It also lists problems with housing and working conditions. The workers and their families traveled to Iowa, following verbal and written promises made earlier that year by Moreno, a federally licensed labor contractor, about jobs in Monsanto’s cornfields. Housing would be provided, they were told. But when they arrived, they found an old building divided into substandard apartments and delays of up to 10 days before they could begin working. Advanced wages, promised to the workers to help them transition into their temporary home, failed to appear. “Some of the workers went around and collected aluminum cans for the deposit, and that’s how they fed themselves and their children,” said Marinda Van Dalen, a RioGrande Legal Aid attorney who worked the case on behalf of the workers. Alegria described the apartment where he and his son lived along with four other people as “in very bad condition.” The apartment consisted of one bedroom, a living room where four people slept on small cots, a kitchen and a bathroom. They had to travel through the bedroom to get to the bathroom, Alegria said. This is a violation of requirements for migrant housing set by the Iowa Department of Public Health and Occupational Safety and Health Administration. Sometimes the hot water didn’t work, which made it difficult to bathe when the workers arrived back from the fields covered in dirt and pollen as well as other farm chemicals. “The workers are working in fields where pesticides are being applied and they have no facilities to wash their clothes, which is important. Workers know that after work they need to shower and wash their clothes,” Van Dalen said. Exposure to pesticides can cause irritation and burning on the skin and eyes, in addition to affecting the reproductive system, causing developmental problems in children and respiratory problems in those exposed. Between 2008 and 2012 there were 2,519 work-related pesticide poisonings in Iowa, according to the Iowa Department of Public Health.Of those, 22 cases were due to contact with a previously treated surface, like treated crops. Alegria’s sister, along with his niece and her children, stayed in the basement apartment. “One of the water pipes broke and everything in the room was damp. They got up one day and everyone got their feet wet because the carpet was soaked. And there were spiders,” he said. The apartments, located in a building in Madrid, Iowa, are owned by Francisca Moreno, who is Alejandro Moreno’s wife, and Micaela Ledezma. Repeated phone calls from IowaWatch to the Morenos were unsuccessful as were attempts to contact them through their defense lawyer. The housing was approved through the Iowa Department of Public Health Migrant Labor Camp Program. The permit requires a self-administered checklist and diagram of the buildings used for housing. 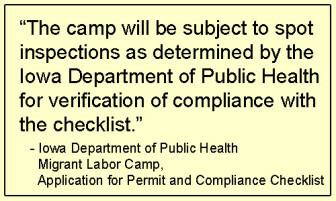 Despite a statement in the application, migrant labor camps are only inspected after a complaint is filed, said Heather Lloyd, who works in the Migrant Labor Camp Program. The checklist asks questions such as whether the water supply is adequate for drinking, cooking, bathing and laundry purposes and ensuring occupants don’t have to pass through a bedroom to access toilet facilities. The housing application filed with the Iowa Department of Public Health says there was a laundry unit a block away. 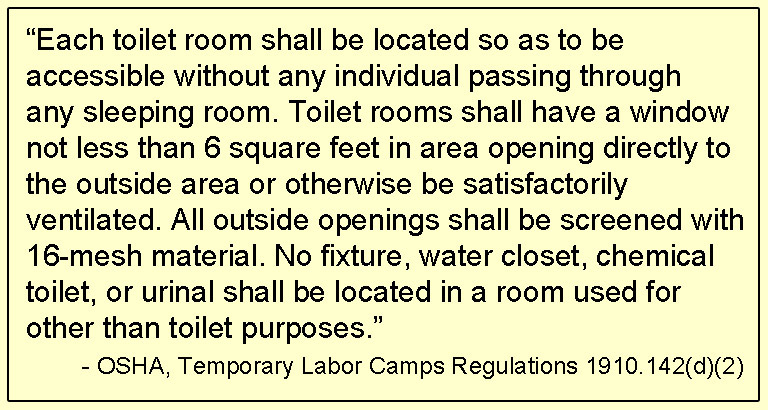 It also said toilet facilities were properly located, Heather Lloyd, who works with the Migrant Labor Camp Program, said. Inspections are made only after a complaint has been filed because of a lack of funds available to do them regularly. And complaints are rare, Lloyd said. During the 2013 operating season, six operators applied for a total of 20 camp locations. All told, camps were permitted to house up to 1,682 people. However, Lloyd said this doesn’t represent the number of migrant workers in Iowa. She said she has noticed a growing trend of operators putting workers up in hotel rooms, a process that does not have to be monitored, or have a permit. Many workers also are responsible for their own housing. An estimated 2,500 farms, orchards and nurseries in Iowa employ migrant and seasonal workers every year, according to the Iowa Workforce Development. Justin Gross, an attorney with Iowa Legal Aid, said he tries seek damages from both the farm labor contractor and the businesses when he takes on a case with a migrant worker cheated of wages or whose contract has been violated. “They (the businesses) will say, ‘We are just working through this guy and we have no idea who he has hired or how they are working. We, as attorneys, argue that they should know and they should follow up on these farm labor contractors and make sure they are doing their job,” Gross said. While companies legally are required to take “reasonable steps” to ensure contractors have a federal license, they often are off the hook when it comes to ensuring the contractors provide a working and living environment that meets regulations. “Although this case settled quickly, the lawyer for Monsanto said they planned to deny responsibility for housing, which is unfortunately very common. There have been some cases in the past that make it very difficult to hold companies responsible for the housing their crew leaders provide,” Van Dalen said. Tom Helscher, director of corporate affairs for Monsanto, responded to questions by email in short, blunt sentences. Monsanto has “agreed with counsel for the laborers on settlement terms and (is) waiting for the paperwork,” he said. Helscher said contractors with Monsanto are required to carry their registration with them at all times and Monsanto has a current copy of all registrations on file, which it checks every year. Although Moreno still holds a license, Monsanto did not contract with Moreno in 2013, he said. He did not explain why. Workers can contact the U.S. Department of Labor with complaints about farm labor contractors. Contractors are required to maintain federal licenses through the Department of Labor in order to recruit, hire, and work with migrant workers. Additional paperwork is required if the contractor wishes to drive, house or transport the workers. Neither Moreno nor any of the apartments’ owners was licensed to house migrant workers. Sixty-three Iowans are listed on the federal database, which includes a total of 8,792 individuals and corporations across the nation. Contractors can work in states outside their listed home address. Complaints made to the department are inspected and can result in the suspension or revoking of the contractor’s license. Lawsuits and Department of Labor complaints are mutually exclusive, Gross said. Often, the lawsuits are settled and contractors keep their license and continue working. Over the past three years, Gross has handled nine cases involving workers not receiving wages earned, having substandard housing or the employer keeping a worker’s passport during the work contract. In that time, he has also handled 30 cases involving violations of the working arrangement and violations of the Agricultural Workers Protection Act. Cynthia Martinez, communications director for Texas RioGrande Legal Aid, said workers frequently are recruited from Texas based on promises of pay and housing. “The workers will say, ‘Yes, I can support my family on that much,’ and they’ll agree to these conditions and then they leave their home and they go one thousand miles away and the promises they were given aren’t kept. A lot of times they end up actually owing money. So then they come back home and they usually are kind of broken by that time and they reach out to us,” she said. Martinez said the legal aid office provides outreach to educate workers, emphasizing the importance of getting written contracts to prevent abuses from occurring. Once abuses occur, the office can provide legal help. “Our hope is to prevent these workers from getting in these situations initially and to be able to defend themselves immediately if they do,” she said. Many workers in the RioGrande case received two different written contracts in addition to verbal promises from the labor contractor. “They were told verbally one set of promises and then were give two contracts with different promises. The written document may say one thing and then the crew leader may say anther. And workers, who are much more adept in oral communication than written, they understandably rely on those verbal promises,” Van Dalen said. She said the practice was fairly common. Alegria said his family received settlement payments from Monsanto for his work, but is still waiting on the check for his son, who as a dependent must see the check pass through a judge first. However, Van Dalen said the payments aren’t enough to deter future abuse. “The federal statutes that protect farmers is quite comprehensive and allows for damages that are really inadequate in this day and age. When you regularly sue these big companies, even when you get a settlement that is substantial from the workers’ perspective, it really doesn’t have any deterrent effect on these companies, which continue each year to violate the laws in the same ways,” she said. This past summer, Alegria said he traveled to Nebraska, again working for Monsanto. In Nebraska, he said he and other workers faced problems with pay stubs, which are required under federal law and should show the number of hours worked and the basis of pay, either hourly or piece-rate. Many workers are paid based on the number of rows they finish. “They paid us, but our pink sheets didn’t show any of what we’d earned. You couldn’t see how much you’d earned or how many hours you’d worked,” Alegria said. In Nebraska, workers were housed in a hotel, where they had to cook outside because there were no cooking facilities in their rooms. They were plagued by rain and dust that made preparing food difficult. 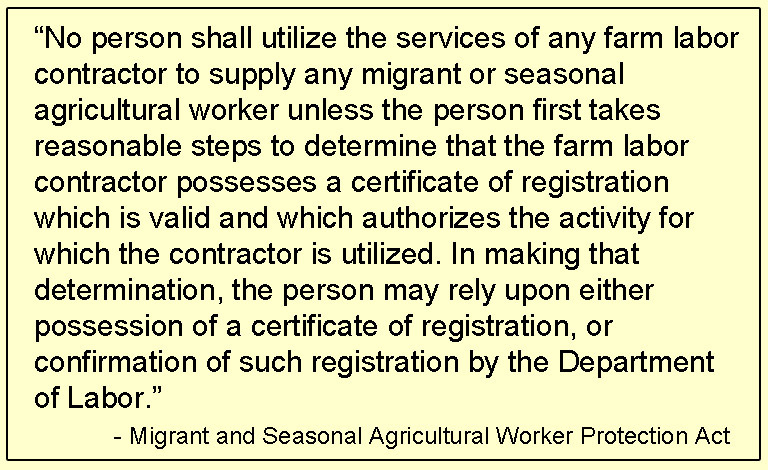 Under federal law, H-2A workers, which is the formal term for temporary agricultural workers, are supposed to be provided with free cooking facilities or receive three meals per day. Alegria said he had to opt for purchasing more expensive prepared food that he could eat in his room. Payments on the hotel room provided by the contractor ceased before the end of the job, he said. Despite the bad experiences, Alegria says he doesn’t believe Monsanto is at fault. 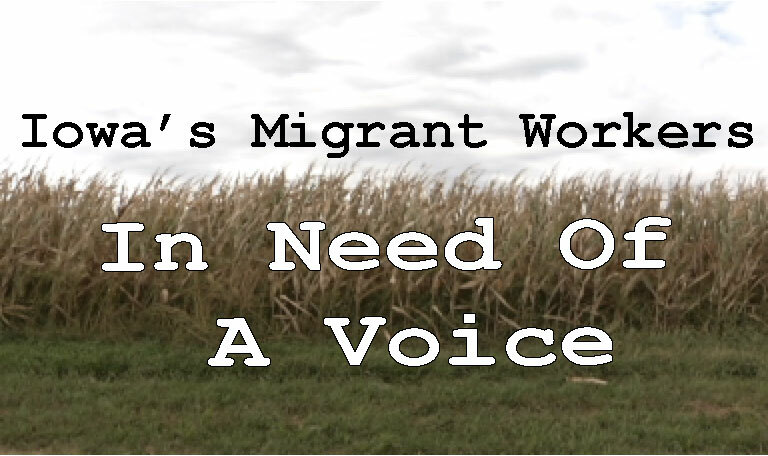 Migrant workers frequently face corruption and have difficulty seeking repayment due to the barriers of language, education, and fears of losing their jobs, attorneys and officials with legal aid offices said in IowaWatch interviews. “It’s a population that is in need of a voice. It’s population that lacks protection. A lot of them leave their place of residence for several months in hopes of a better life, earning a better wage,” Gross, the Iowa Legal Aid attorney, said. Legal aid organizations are unable to represent undocumented workers, Gross said, but the codes and regulations technically protect undocumented workers. Gross is also on the board of Proteus, an organization that provides outreach to migrant workers. This outreach provides education about worker’s rights, which is a key step in protecting migrant workers regardless of their legal status, he said. Gross also said Proteus advises workers to keep records of the days and hours worked, as well as saving any paperwork they receive and getting copies of working agreements. Having these records can make it easier to prove claims in court. Gross said more enforcement is necessary to ensure businesses are using certified farm labor contractors and penalties for hiring non-certified contractors. Lauren Mills was one of 25 fellows selected to attend “Covering Big Agribusiness in the Heartland” – a workshop funded by the Robert R. McCormick Foundation and co-hosted by the Midwest Center for Investigative Reporting and Investigative Reporters Editors. The workshop, held May 30 – June 2, 2013, in Champaign, Ill., brought together reporters, editors and photojournalists to deeper explore issues in agribusiness. This story is one of several published or in production based on the workshop and its collaborations. This IowaWatch story was published in the Des Moines Register, The Gazette (Cedar Rapids, IA), Mason City Globe Gazette and The Courier (Waterloo-Cedar Falls). With morning temperatures approaching 90 degrees one day in July 2015, a migrant laborer walking down rows of corn began to experience symptoms of heat exhaustion, including difficulty breathing and extreme nausea. The laborer was working near Boone, Iowa, for an independent contractor with the St. Louis-based Monsanto Co. I work at Monsanto and I can tell you that Monsanto takes treatment of workers very serious – if any any employee even think there may be abuses they are encouraged to report it to the highest level.